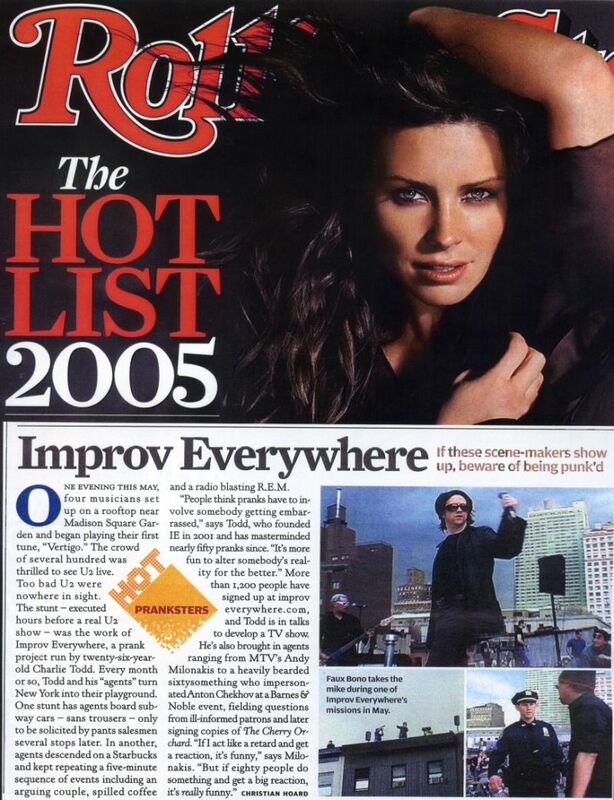 Improv Everywhere was named “Hot Pranksters” in the 2005 Hotlist issue of Rolling Stone magazine. Take a look at a scan of the article. Improv Everywhere is finally getting its due props. Congrats. After the constant barrage of “hot” useless celebutante whom contribute nothing to society, natural disasters revealing horrendously inadequate bureacratic nonsense and mass suffering, learning that the idle rich are spending more money while the rest of the country finacially seizes, and the general feeling of hatred and ill will that permeates every artistic institution i’ve tried to be a part of, I just have to say, I am so glad you guys exist. Thank you for being.